When my grandmother passed away four years ago, she left behind many possessions that my father had to take into his house, and keep in storage. 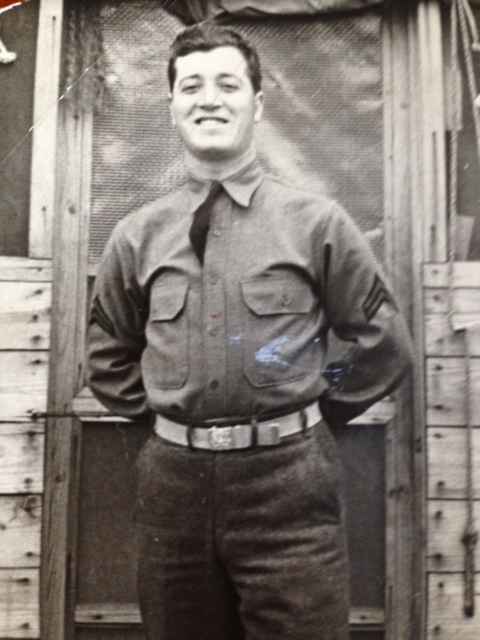 Some of those most prized possessions are documents and letters written by Dominick DeGiorgio, from his time served in World War II. Dominick was my great uncle, my grandfather’s brother, and the “life of the party” within my immediate family. While he was in training camps here and in combat overseas, he wrote many letters to let the family know he was doing well, and send his love and regards. Many of the letters are in his native Italian, but a select few were written in English, showing off a skill with a language that was not his first. The letters are poignant, and at times funny. The one I’ll share with you within this post was postmarked a week prior to his being killed in action. He survived the D-Day invasion that took place 70 years ago today, but could not stave off the inevitable fate that some will say was God’s plan. War was Hell, and it extinguished a bright life from our family. This letter in particular was addressed to my grandmother. At the time, I don’t think my grandfather could read English very well. A few lines to let you know I’m in the best of health. I hope this finds you, my brother, and Joey the same. I’m sorry for not being able to write more often, but we have been moving fast, and on the go all the time. I guess you have been reading the papers how we are beating the Germans here in France. Well, this paper that I am writing on is German paper they have left behind while running away from our tanks. You would be surprised if you could see with your own eyes and the things they have left behind so that they could run faster towards Germany. We have been doing a lot of walking, and some days are very hot, but at night it cools off so much that you need two or more blankets to keep warm. Of course, we don’t sleep much, and when we do, it’s usually without blankets. Rosa, in your next letter let me know if you received any more mail from my family. I really miss everyone, and wish that I could be more near all of you. I hope that this war soon ends, and then we can all start over again, just as if there had been no war at all. The people that we free here in the cities are very happy. Did you see the newsreel of the parade of Paris? It’s getting dark now, so I am closing by sending my regards to all who ask of me. Hello to Tony and family. Regards to your mother. Love and kisses to you, my brother, and Joey, as always. As I go through life, I feel an immense gratitude for all that I have. Like many other people, I feel that family is a big part of that. To read these words again from the razor thin German paper they were written on, to be able to type them here and share the thoughts of a man who has been gone for 70 years, boggles my mind. The old-school man in me can’t take for granted the technology that allows this. As I see his words on a page, I imagine Dominick with his pen in hand, still in his sweat and mud stained uniform, with artillery shelled city blocks surrounding him and his brothers in arms. Fearful of his fate, with the hope it’s all just a nightmare. As if there had been no war at all. Like many others, he would pay the biggest price there is. His fear would be realized, and he would become a war time statistic. The battles are faded history. Many of us have forgotten. Seventy years later, as the anniversary of D-Day looms, I’ll think of Dominick. The family man. The life of the party. The fighter. The patriot. Thanks for sharing Dominick. Keep those photos and letters coming. our very own hero. thankyou for writing about Zio Dominick. Beautiful tribute, thank you for sharing it.